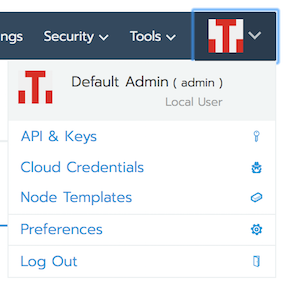 Within Rancher, each user has a number of settings associated with their login: personal preferences, API keys, etc. You can configure these settings by choosing from the User Settings menu. You can open this menu by clicking your avatar, located within the main menu. Cloud Credentials: Manage cloud credentials used by node templates to provision nodes for clusters. Note: Available as of v2.2.0. Node Templates: Manage templates used by Rancher to provision nodes for clusters. Preferences: Sets superficial preferences for the Rancher UI. Log Out: Ends your user session.